We’ve never met Karen, but she is a friend of my aunt and uncle, by way of Albuquerque. 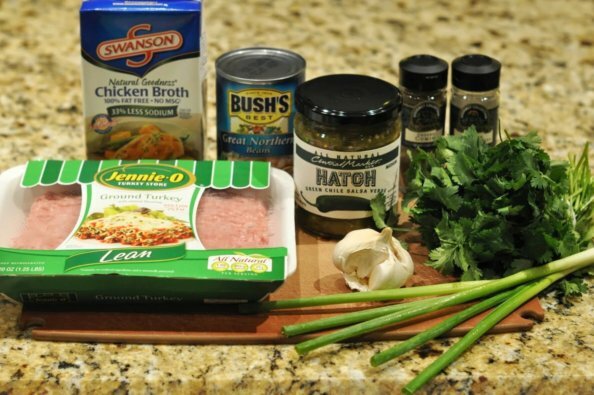 And we’ve always heard really good things about this easy and delicious stew recipe she made up using ground turkey, chicken breasts, green chili salsa and white beans. My aunt and uncle made it for my parents, who liked it so much that they make their own version all the time (omitting the chicken breasts for more of a chili texture than stew.) My parents have raved about this dish often enough that we finally had to try it for ourselves, and it will become a regular in our recipe rotation as well. This chili / stew is healthy comfort food that is also light enough to serve during the heat of summer (especially garnished with fresh avocado and a squeeze of lime) and could not be much easier to make. We adapted the recipe a bit (of course we did), but will continue to foster the shout-out to the Karen who created the original recipe by continuing to call it “Karen’s Stew,” even though our version is a little different and is really more of a chili than a stew. It’s the right thing to do. We like using sauteed onion as the base for lots of different simmer-in-a-pot kinds of dishes — from chili to tacos to soup. Heat a tablespoon of vegetable or canola oil over medium-high heat and cook the chopped onion until it softens — about 6-8 minutes. (My onion cooked a little long — note the browned pieces — but that didn’t seem to affect the finished dish at all. Add minced garlic and a bit of cumin and coriander (spices we like together and always have on hand) and cook until fragrant — about 30 seconds. Add the ground turkey and cook until no longer pink — about 5-7 minutes. Break up the turkey into tiny pieces while it cooks. Add chicken stock, a jar of pre-made green chile salsa and a can of Great Northern white beans (undrained) and simmer, uncovered, over low heat for at least an hour, stirring occasionally. You can use whatever kind of green chile salsa you like (Arriba makes a good one) and however spicy you like it. Since we made this dish during Hatch chile season, we used a jar of Hatch green chile salsa that we picked up at our local Central Market. You could probably just use green chiles, but the salsa will give more layers of flavor to the finished stew. Add salt and pepper to taste. Serve the stew garnished with chopped cilantro and green onion tops, sliced avocado and maybe a few jalapeno slices for an extra kick. Perhaps a dollup of sour cream if you’re feeling the need for a little tang. Grated monterey jack cheese and a slice or two of crusty bread would also be good with this dish. So many possibilities. I wonder if Albuquerque Karen would be pleased to know she has a delicious (and easy and versatile) chili stew named after her? Heat the oil in a Dutch oven or large pot over medium-high heat, add the onion and a dash of salt and cook until the onion softens — about 6-8 minutes. Add the garlic, cumin and coriander and cook until fragrant — about 30 seconds. Add the ground turkey and cook, breaking the turkey up into tiny pieces, until no longer pink — about 5-7 minutes. Add the salsa, beans and chicken stock and simmer, uncovered, for at least an hour, stirring occasionally. Season with salt and pepper to taste. Top with garnishes of choice and serve.